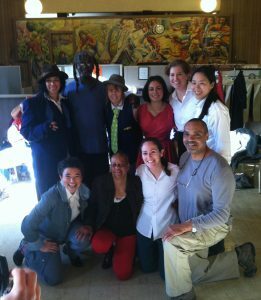 BERKELEY – Last Friday, Berkeley Food & Housing Project (BFHP) hosted a special performance of Twelfth Night as performed by California Shakespeare Theater’s all-female cast. Attendees included BFHP’s clientele, underemployed and underhoused men and women currently residing in the Berkeley area. The event included a free dinner and a chance for audience members to mingle with the cast and crew. The Twelfth Night cast and crew is bringing the show to non-traditional spaces in the Bay Area including juvenile detention centers, youth development groups, and public libraries. Michelle Hensley, founder of Minneapolis-based theater company Ten Thousand Things (TTT), took on a Director role for this production of Twelfth Night. Hensley’s goal in bringing the TTT model to the Bay Area is to bring theater to diverse audiences with limited access to the arts. TTT’s shows are high quality, in addition to being highly accessible: the shows annually top “best-of” critics’ list, and last year Minneapolis’s Star Tribune named Hensley “Best Theater Artistic Director.” The Bay Area production of Twelfth Night is supported by Intersection for the Arts, The Andrew W. Mellon Foundation, The James Irvine Foundation, and Art Works.